My problem is that I can't quickly calculate lighting for an object or two....my minimal time is like 15 min. I'm sure that UE calculate lighting for the whole level! Why? What I'm doing wrong? Please gimme a clue. Calculations for one, simple object should take up to one minute, right? That option is setting lightmap resolution for selected objects. 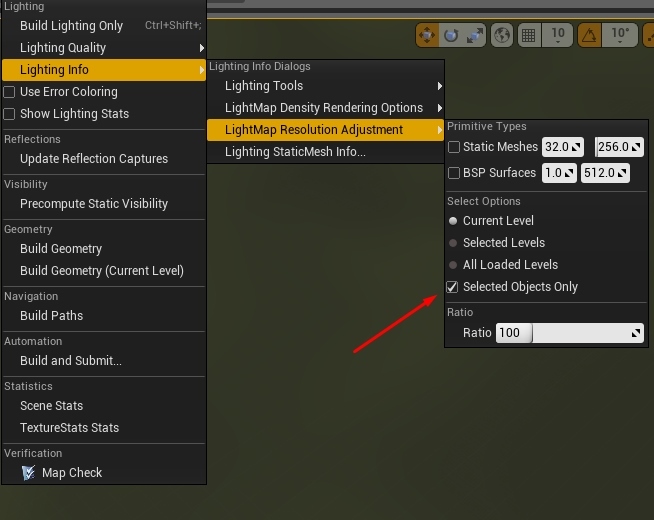 Currently there isn't an option to build lighting for selected objects only as far as i know. "Another option is to scale the lightmass importance volume as small as you can afford to encapsulate those meshes,"
I wrote it in 1) - it's not working well IMO=> with 3x3x3 volume I still needed 15 min. to calculate lights. Probably I'll copy my scene, delete everything except few meshes and voilà. Too bad UE hasn't got any better solution. It was actually requested before and i think it will be implemented sometime in the future. So...how I can quickly test my objects? Do I have to create a special level for testing or there is any other method? If you want to test lightmap resolutions for meshes then yes, you better create a very basic level and do your tests there. Another option is to scale the lightmass importance volume as small as you can afford to encapsulate those meshes, but my first suggestion is the safest for now.